A lawyer website should not only be aesthetically pleasing, it should also convert for your practice. When potential clients visit your website, it’s extremely important to have a mobile friendly website that is easy to navigate. Your practice areas, attorney bios, and contact information should be easily accessible. 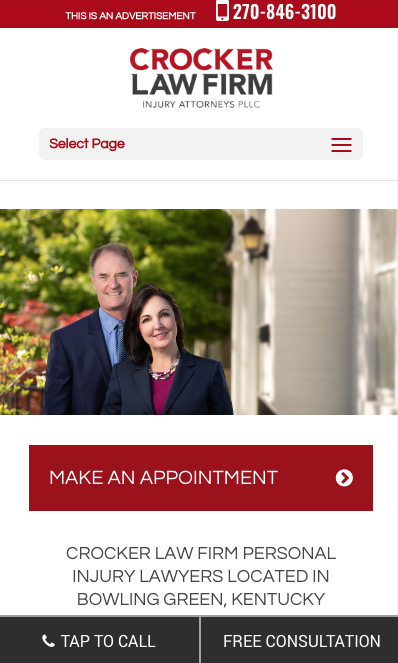 Our most recent lawyer website was created for Crocker Law Firm in Bowling Green, Kentucky. This site boasts multiple custom features that our web team is very proud of. We created a custom review module for each page. We also included a floating “contact us” side tab that loads a contact form for users. This project was a complete website rebuild, including all new content. We worked with the Crocker Law Firm team to populate this website with important practice information, stunning photos and original videos. We’ve worked with Crocker Law Firm, creating content for the practice for over 4 years. It’s exciting to have a new web destination for Crocker Law Firm, created by Sublime Media Group. For mobile, we created click to call and free consultation buttons for the bottom of the phone. with both buttons, clicks are trackable for conversion monitoring. Our mobile lawyer designs are easy to navigate for any website visitor. Sublime Media Group’s web team offers a variety of SEO services for lawyer websites. We will battle your competition for search engine top spots and display your information as SEO friendly as possible. Contact a Sublime Media Group representative and let’s get started transforming your practice with a custom lawyer website. You can stand out from your competition and grow your practice with proven results.